We’d love your help. 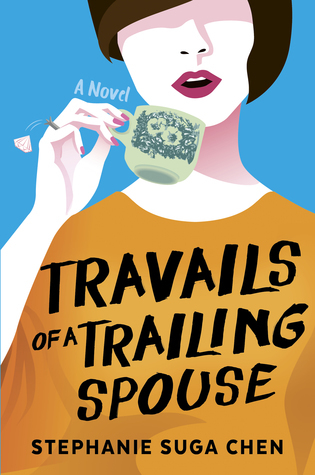 Let us know what’s wrong with this preview of Travails of a Trailing Spouse by Stephanie Suga Chen. The country is easy enough to adapt to (though the prices of some things? Jaw-dropping!) a The adventure starts when Sarah’s husband, Jason, is offered a position at a university in Singapore. Sarah, a successful lawyer in the US, quits her job and the couple say their farewells, and, with their two children, fly off to a new country, a new condo, and a completely new life. To ask other readers questions about Travails of a Trailing Spouse, please sign up. As I also moved from the US to Singapore, I freely admit to being biased when I say I found this book pretty boring. I can see why it would be interesting to people who’ve never been to Singapore or who’ve never lived abroad, but for me it was just a bland recitation of the complaints and discoveries I’ve heard expats talk about ad nauseum for the past 6 years. I think the main issue I had was the “and then this happened” style of the plot, something that occurs when a writer draws heavily from t As I also moved from the US to Singapore, I freely admit to being biased when I say I found this book pretty boring. I can see why it would be interesting to people who’ve never been to Singapore or who’ve never lived abroad, but for me it was just a bland recitation of the complaints and discoveries I’ve heard expats talk about ad nauseum for the past 6 years. It is 'life in Singapore' from the eyes of an expat. Even though it feels like the 'First World' complaints of rich wives, there is more to this book than that. With witty ends to each chapter and the internal struggles of intelligent minds this book makes you question the definition of success. Where does the feeling of being worthy arise from, is a question that is beautifully explored in this novel. Reading Travails of a Traveling Spouse was like sitting down for a good gossip with a girlfriend in Singapore. Many of the characters are familiar–whether because they resemble actual expats I’ve met, or fit the widely accepted stereotypes. It’s a breezy, enjoyable read. It is the antithesis of Crazy Rich Asians, which was a soapy take on the uber-rich of Singapore. Chen captures, honestly and beautifully, the journey of becoming an expat when you transition from working woman to stay at home mom Reading Travails of a Traveling Spouse was like sitting down for a good gossip with a girlfriend in Singapore. Many of the characters are familiar–whether because they resemble actual expats I’ve met, or fit the widely accepted stereotypes. It’s a breezy, enjoyable read. It is the antithesis of Crazy Rich Asians, which was a soapy take on the uber-rich of Singapore. Chen captures, honestly and beautifully, the journey of becoming an expat when you transition from working woman to stay at home mom in a new country. The thrill of excitement and discovery, and then the alienation that comes with attempts to fit into a new role and a new country. Through Sarah and her friends (all of whom are having their own, different, experiences) you get a peek into a certain type of experience of expat life in Singapore. I say certain, because most expats never have a run-in with the law! The characters are three dimensional, and unique in their voices. Sarah struggles with her role as a stay at home mom, her anxiety at dealing with a strange country’s legal process after her husband is arrested for fighting (even though he wasn’t the one who was fighting, but he was drunk at the time), her anger and the strain on her marriage that Jason’s arrest causes, and ultimately the ebb and flow of expat life as things and people change. Chen drops in details, like that FDW’s (Helpers) are often acting as a second mother/aunty to your child while their own children grow up far away without their mothers, and that visits are rare. However, she does so deftly, without changing the tone of the book from fiction to non-fiction. I appreciated this little nuggets, as they serve to show that the ease of expat life often comes at the expense of others, or that Singapore is often bewildering to expatriates and why. This is also the story of expats who aren’t white, and I’m so glad to see that representation. However, there’s one element that is missing from the book, and it’s a bit of a damned if you do/damned if you don’t situation—Singaporeans. There are Singaporean police. There are background Singaporeans. But there are no Singaporean friends, and it’s noticeable. However, had she written in a character, it would be difficult to capture the Singaporean voice and the character would be a token character. But I think that this, too, isn’t an uncommon expat experience. I’ve talked before about the expat bubble, and Sarah and her friends live in it. As an expat living in Singapore, I related to many of the stories and sentiments shared in this story- particularly about losing and redefining ones identity. I thought this struggle, along with the strain it ours in relationships was well conveyed. I also admit that I enjoyed getting to know the author’s story (loosely based on real-life) a bit more as she is a new acquaintance of mine. This book didn’t get five stars from me because of the style of narration. I didn’t find myself getting lost As an expat living in Singapore, I related to many of the stories and sentiments shared in this story- particularly about losing and redefining ones identity. I thought this struggle, along with the strain it ours in relationships was well conveyed. I also admit that I enjoyed getting to know the author’s story (loosely based on real-life) a bit more as she is a new acquaintance of mine. I feel as though I just finished reading a journal of an ex-pat housewife in Singapore rather than a thought-out storyline. The whole book revolves around the mundane every-day gossip-y lives of neighbors and friends, and the exciting parts are all the new things like fines for littering, air conditioning, and helpers in Singapore. Having just been there, it’s fun to read, but from a plot perspective and character perspective, it’s not really all there to keep any real interest. Getting into a p I feel as though I just finished reading a journal of an ex-pat housewife in Singapore rather than a thought-out storyline. The whole book revolves around the mundane every-day gossip-y lives of neighbors and friends, and the exciting parts are all the new things like fines for littering, air conditioning, and helpers in Singapore. Having just been there, it’s fun to read, but from a plot perspective and character perspective, it’s not really all there to keep any real interest. Getting into a public fight is not a strong enough conflict, and neither is the speculative infidelity of some lady’s husband - who incidentally we have very little characterization to draw any empathy for. I suppose that’s the whole idea of the book - all these non-events make up the boring lives of these people, and they have to find ways to “exciten” them up. Let me preface this by saying I am an expat living in Singapore (from Australia). I found this book weak. The plot was predictable, the characters were superficial and I was particularly disappointed with the way it glossed over the foreign domestic worker situation within the country. This book is exactly the kind of book I want to bring with me on vacation - a bit of drama and suspense, lots of laughs, and characters that feel modern and real. I tore through the pages of this book, really enjoying the character development and intertwined relationships. I loved the realistic depiction of the expat experience and fascinating perspective on moving to a place so different than home. I found the book very relatable even though I'm a guy and have never lived abroad. The expat life is inherently interesting and it sounds like a nonstop party in spite of having kids. I also found myself wondering how much is based on real events - it is written in a way where it is hard not to believe almost everything happened. Perfect for those looking for a easy-to-read page turner! I felt like I was getting the "inside scoop" on the expat experience- crazy, but still full of the realities of family life. The characters are well-written and complex, yet relatable. Light read, some what relatable to my expat experience. Quite boring in parts hence why it took so long to read. This was a bit of deja vu - most of these scenarios are found on the expat wives' FB pages online - could have saved myself the $18.50. I am biased since I have been an expat wife for a while now. It's a very entertaining book that still showcases the real social issues that families face who choose this lifestyle. This is an account of a quite common new expat experience in Singapore. For many new arrivals under 40, it’s like being in college again — the good and the bad. a light and fluffy "popcorn" read, which was what I wanted for a "convalescing" read. an enjoyable enough sorta-voyeuristic ride into life of an expat wife here, even if it's a "skimming the surface" account. Almost always interesting/fun to read books written by i) citizens with Singapore as the backdrop, ii) a visitor who has briefly spent time here or iii) a visitor who has since considered the island home. Loved it. Just a totally fun book to read, loved Chen (main character), loved pretending I was in Singapore... Is there a sequel?